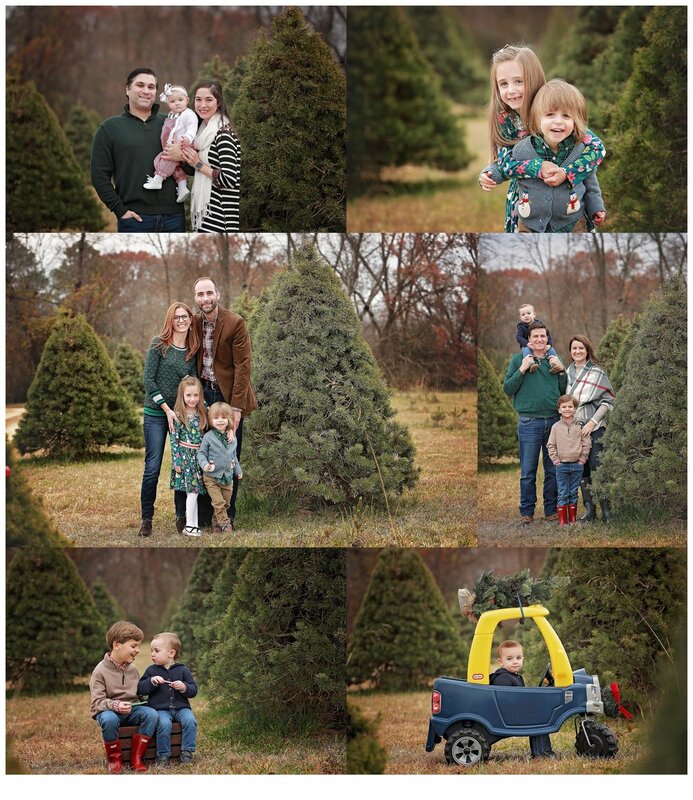 This year there was a little snag in the Christmas Tree farm mini's. The farm i was going to use decided to close down with out letting anyone know. Thankfully I called to confirm and found out the farm is not longer available. This gave me a few days to find another farm. Mr. Tom at Windy Knoll Tree farm was so nice and his farm was just beautiful. We had so much fun with all the families that came out, I think it’s safe to say we will be offering them for many years to come! Everything was perfect – the weather (BOTH days!). Thank you, everyone who came out, We’ve loved all the positive feedback we’ve gotten from these mini sessions! We are still getting emails saying how much fun people had, which makes us grin from ear to ear! Truth is, we couldn’t have done it without you guys! I'm opening up a few morning spots for Nov. 5 th. The afternoon is completely booked. Thank you everyone. If you would like to book an early morning mini session please inbox me. I'm also opening up Oct. 15th & Oct 28th for Fall mini's Please share with family and friends. I'm excited to announce i will be scheduling Christmas Tree Mini's on Nov. 26th & Dec. 2nd location TBD. I have photographed at a tree farm for a few years now and would like to open it up to returning clients and new clients. Mini session are condensed sessions. This allows time for 2-3 variations of a family pose, a group pose of children, and one of the parents. If time permits, other variations can be included but are not guaranteed. Dates and times are are first come, first serve and filling quickly so don’t wait! Fall is fast approaching, This is my favorite season watching my kids play soccer, watching my daughter cheer for her high school football games, pumpkin spice, and cozy weather! And what’s a better time to get some updated family portraits and beautiful artwork for your walls! Session will take place at a park close by Richmond, VA exact location TBD by Wednesday evening to ensure the perfect spot! Session fee is $140 and includes 5 digital downloads. i photographed this sweet little boy, he was a dream to photography. This was my first time using the Posing Pod by Little Prop. It was very easy to use and i will use it more. I wanted to take a minute and just say how absolutely grateful I am to wake up everyday to a career I am wholeheartedly in love with! This job can definitely be exhausting, chasing toddlers, making all kinds of crazy noises to get a smile and posing babies who don't want to be posed. It can be hot, sweaty, emotional, frustrating and overwhelming but i never tire of it. It's mostly just hot and sweaty! I never get sick of seeing the cutest baby butts, the longest lashes, cooing and giggles. I never tire of capturing the most ADORABLE images of baby and swaddling. I never get sick of the look on my clients faces when i show them the smile on their new baby's little face. I never tire of hearing how much they adore their images and how they loved watching me pose their precious one. I love the way babies smell, the sounds they make and their facial expressions. I love when they sleep, I love when they're awake and i love the images of a pouty, crying face. Most of all, I love the face that people are choosing ME to capture such a special milestone in their lives. That is the biggest compliment. Here are some recent favorites of mine from May and June. When planning a session, it helps to pick one main color that will be present in all the shots- then add complementary colors to the images to add a bit of interest and to compliment ( yes, i said complement...not over power) the images (or baby!) as a whole. The images below are a few of the props i have available for you to choose from. I always try and to incorporate a prop into each session. Take a look below to see the types of buckets, baskets and wreathes available to you during your session. Choosing the color scheme and props involves a little planning and thinking about what the end goal will be. Did you want a wall display? custom framed prints, gallery wrapped canvases or an Heirloom album. Whatever your goal may be, my goal as your photographer is to take the color scheme you would like and make beautiful images for you to display in your home. I have several baskets, a curved wicker basket, a flatter longer basket and a brown crate all make for adorable props. I also have a white birch tree truck for the winter months and a sling for a simple clean fresh in the womb feel.
. I have a few cream buckets to choose from one taller then the other, an antique silver bucket as well as an antique wood bucket. For the all around little boy pose i have a dump truck to place baby in. This sweet little bundle of lovin was sooooo super squishy and super sleepy! I'm not sure she even opened her eyes once now that I think back on it. ...and can we just talk about those rolls! 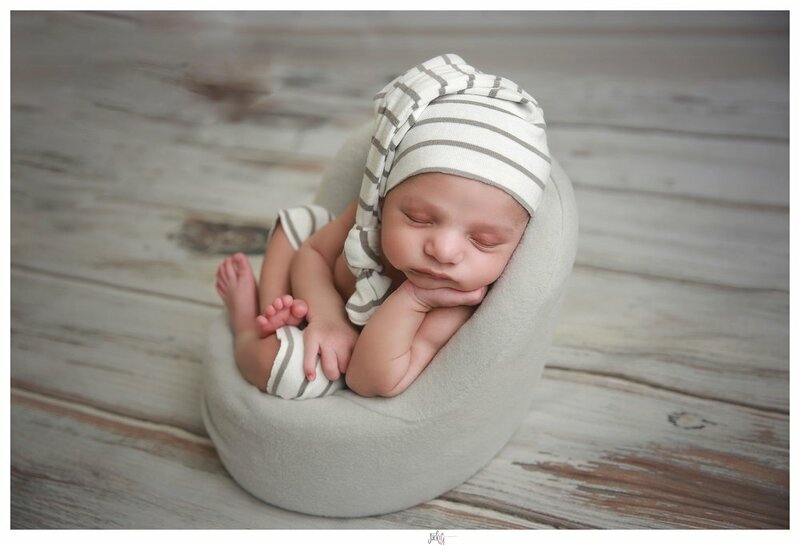 This sweet little boy was a dreamboat for his newborn session! I think that his family images might be some of my most favorite ever! He already has Mommy wrapped around his finger. I am so blessed to be able to share in these special moments with so many families! I’ve just loved watching Zoey grow over the last year. I’ve had the joy of seeing her in the studio/location every few months to capture all of her milestones! Her cake smash session was just the icing on the cake to top off the wonderful year we have had together. Z. was not a fan of the cake but soon warmed up and had fun. 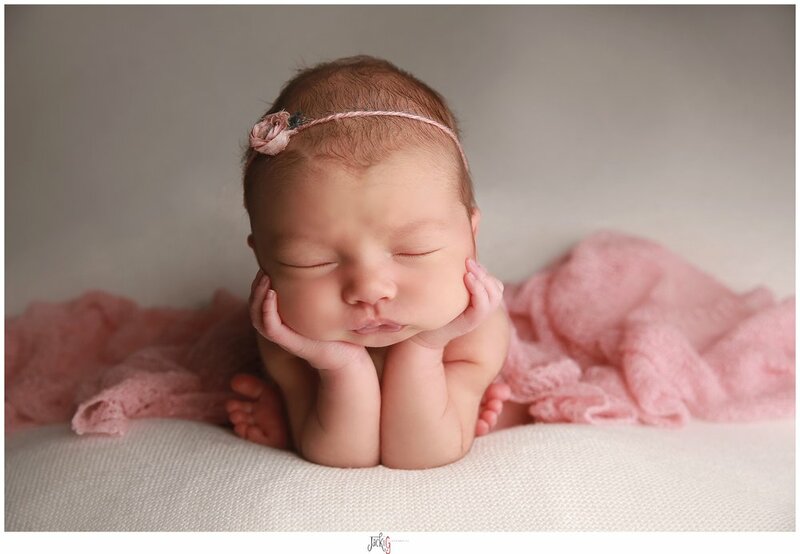 So in the ever growing world of newborn photography there are zillion poses and positions we photographers persuade our gorgeous models to wriggle into to achieve the cute images that are so popular, but there is one that seems to be the holy grail of many photographers...the frog pose. lts a divisive pose, with some loving it, and some hating it. But whatever your opinion of it, there is one thing that is vital to remember. No baby can hold that pose on his own. Fact. So, great care must be taken to ensure no baby is harmed or upset when doing it. Personally, l refuse to accept the stance that in the right hands a baby will balance. l don't care.....no, l REALLY don't care! l don't care if you can get a baby to balance in the pose.....letting go is dangerous! So how do l get the images l do without ever letting go? Well, firstly l needed to know l could be skilled enough in Photoshop to allow me to merge the necessary images together. Then l had to know l could persuade the baby to settle happily in the necessary position. l didn't even attempt the frog pose until l was over two years into my career. l was not prepared to ever try it until l could be sure l could do so safely. Not every baby will do the frog pose. Part of doing it well and safely is developing the skills needed to know which will, and not trying it with those who wont. That all comes from reading each baby. They are all different, and a huge part of what l do involves getting to know them a little bit, and if l'm honest, loving them a little too. Once l think a baby will do it, l ask the parents if they'd like me to try. As l said, not everyone even likes the resulting image. l wouldn't ever do it without asking. So each time its done, the parents are helping or an assistant is helping hold the baby. You will see that each frog pose l have done is of a baby happy, relaxed, comfortable and sound asleep. No matter what pose l do with a baby l am gently moving arms and legs, hands and fingers, gently moving and using lot of gentle motions to get baby to leave them where l want for the images. This pose is no different. l gently move baby until l am happy baby is relaxed and settled. lf l try and baby doesn't want to do it, l don't push it. That's totally ok, and sometimes l try and then don't get the pose, even though l thought baby would. Once baby is in position, l have my assistant or parent gently support baby with one hand and take the images. then they hold baby wrists with the other, moving the position of their hand in between. They NEVER let go. hands are on baby at ALL times. You can see the two images l take below, and how l then use them to create the finished image. You can see that even as hands are moved, baby remained totally relaxed and asleep. So, if you love the frog pose, and would like your photographer to do it for your baby, please don't be afraid to ask them if they do it as a COMPOSITE. They'll know what you mean. Ask them to show you images like the ones above. lts your baby. PLEASE don't assume that just because they claim to be safe that they are. The industry isn't regulated, and probably never will be, so its important that you know how to keep your baby safe during the session, and especially when doing this very clever, but very skilled pose. I'm a certified birth doula who transitioned into a full time newborn/ family photographer. I love births and i love new babies. I have been wanting to photograph a newborn within the first few days of their arrival in the hospital setting for so long! I've now photographed over 20 births, but a Fresh 48 session is different because I arrive after baby is born, usually a day or two afterwards, and don't capture any of the labor or birth. The benefit of this is that new parents get to remember those early days through these images, without the sometimes scary idea of having a photographer actually attend your birth. I know that turns lots of dads - and moms - off, so this is a great compromise. Mom gets to ensure that she looks the way she wants for this session, the lighting is more predictable since it's not usually at night, and there's no bodily fluids involved in the final product! I love birth photography so much, but I loved capturing this special time almost just as much! Here are some of my most favorite photos from meeting Y. for the first time. Introducing gorgeous baby N! I dare you not to fall in love with this little man. He was such a snuggler! I hope you enjoy his sneak peek and feel free to leave a comment at the bottom of the page. Beautiful Newborn baby girl! She was an older newborn and slept like a champ during his session. This little stunner was simply perfection during her newborn photography session. She had a couple quick snack breaks but other than that she slept right through allowing for lots of great shots. I hope you enjoy the sneak peek. My word what a beautiful baby boy! He was such a good sleeper and made newborn photography look easy. I'm completely in love with how his gallery turned out. I hope you enjoy the sneak peek. Jacki G. Photography specializes in maternity, newborn, babies and family photography. Please contact me for availability. I photographed the M. family a few months ago and just recently V. asked me to photograph her maternity session and newborn baby. I was honored to document the new addition to the family. Enjoy the sneak peek. Jacki G. Photography specializes in maternity, newborn, babies and family photography. Please contact me for availabity. How cute are these two ONE yr old twins. They were just the cutest and loved their cake. Enjoy the sneak peek. Babies are such a blessings and having twins is double the miracle. Enjoy the sneak peek. Baby Josiah is ONE!! I cannot believe it's been a year since his newborn session. I photographed his milestones, from newborn to just holding his head up to learning to sit on his own, to pulling himself to a standing position and now walking...sweet memories his parents will charish forever. Jacki G. Photography specializes in newborn, baby, maternity and family photography in Richmond, VA and surrounding counties. Contact us for availability. This is one sweet newborn girl! Just 9 days new and just a doll. Her big doggy sister was a great protector during her photo session. This is such a lovely family, I wish them all the happiness in the world. I don't know about you, but i'm ready for warmer weather! 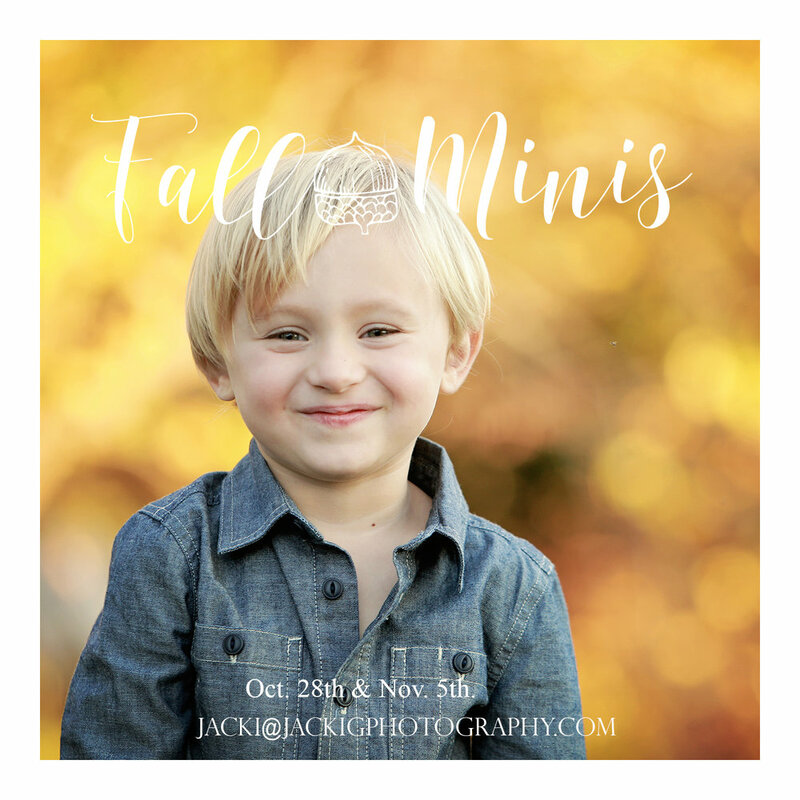 Spring is right around the corner and so is SpRiNG Mini sessions! Dates: April 15th 8 a.m.-10 a.m. or 4 p.m.-6 p.m.
What does my session include? It's a 20 min. session. ( it can be families, babies **NOT NEWBORNS** kids, couples and Seniors. You will receive 5 digital downloads. Photo shoot takes place at an outdoor location TBA. I will also have April 22nd for Studio Spring Mini sessions. Times 10-2 pm. These sessions take 20 min. At my home studio. Please leave a comment if you would like to book a session or send me an email.